In just 9 days, we will have ended the year with just 2.83 inches of rain. Two of those whopping 2.83 inches came in January through April. All of the 2.83 inches came over a total of 20 days. For those of you who manage golf courses as well, let that sink in for a bit. 2.83 inches. I remember my time served back in Michigan and fretting when we went a week without rain. It is now three days before Christmas and I am still watering wall to wall every few days. For now, the state of California has not declared a drought emergency, but with 75% of fresh water to the Western States being provided by snow melt and snow pack at 17% of normal, it seems eminent. To push the issue, local lawmakers are calling on President Obama and Governor Jerry Brown to declare a drought emergency which would allow the transfer of water from wetter regions to California. All the talk of drought at the club led me to a conversation with our Director of Golf, Adam Schiro, about cloud seeding. It is something I had never heard of until now and has led me to the conclusion that rain dancing still has a chance. 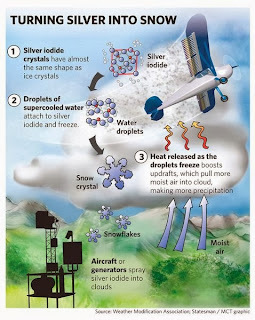 There are two types of cloud seeding; cold cloud seeding and warm cloud seeding. 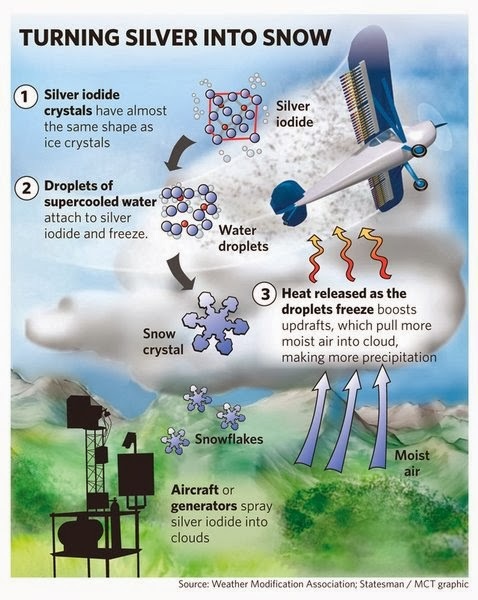 Cold cloud seeding is more prevalent and it involves dispersing silver iodide throughout the clouds. It has been very successful dating back to the first successful cloud seeding in 1915. It was actually too successful as Charles Hatfield's chemical brew led to a 17 day downpour over San Diego leaving behind 28 inches of rain and left thousands of people homeless due to mudslides. Cloud seeding evolved into other uses such as being used as a tool/ weapon for our military in what became known as Operation Pop Eye. The Chinese also used 1,104 cloud seeding missiles in 2008 to remove the threat of rain ahead of the Olympic opening ceremony in Beijing. There theory, which by the way kept the ceremony dry, was to head off any rain clouds heading toward Beijing by making them precipitate prior. Currently, 11 Western states participate in cloud seeding or weather modification. It's latest technological leap will involve the possible use of drones to disperse the silver iodide into the clouds. That testing is to be conducted in the fall of 2014. The topic of cloud seeding to me as you have read is fascinating, but what does this all mean for Cinnabar Hills Golf Club? It means that when 1/1/14 rolls around, we will still have ended the year of 2013 with 2.83 inches of rain and while cutbacks haven't been decided, we will need to be prepared. Preparing for a drought year means prioritizing what needs water and where we can lose the water. Our order is greens, tees, landing zones, clubhouse and driving range. It will involve the heavy use of wetting agents to maximize our watering efficiency and a whole lot of hose work to just maintain. Constant evaluation of our system will also be vital. Until then, I will still be dancing and hoping for just one drop. Maybe Thomas Bastis of California Golf Club could put a little silver iodide in his quad copter to assist with our troubles. You never know?